Although it has been placed in the Onion & Garlic family (Allium) it smells of neither. 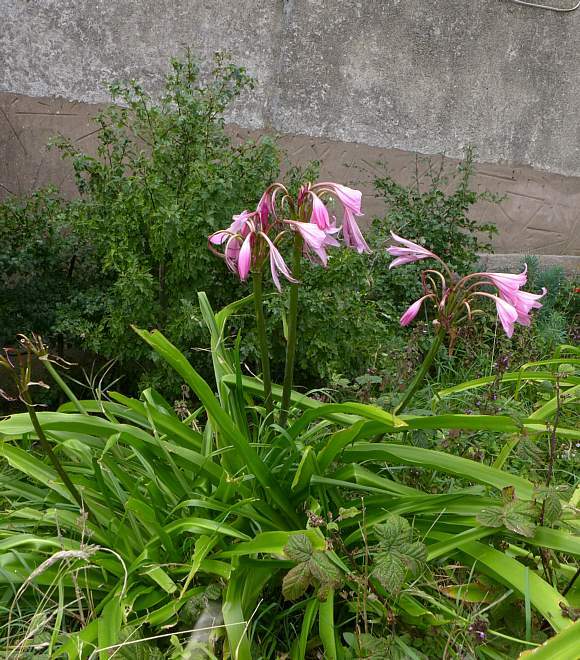 An erect but not particularly upright plant growing to 80cm long. Leaves 60-120cm long, linear and hyperbolically curved in two dimensions. A spray of flowers on single stems emerging from the top of the main stem, some here yet to open. One has been broken off in the high recent winds. Others are starting to fruit. 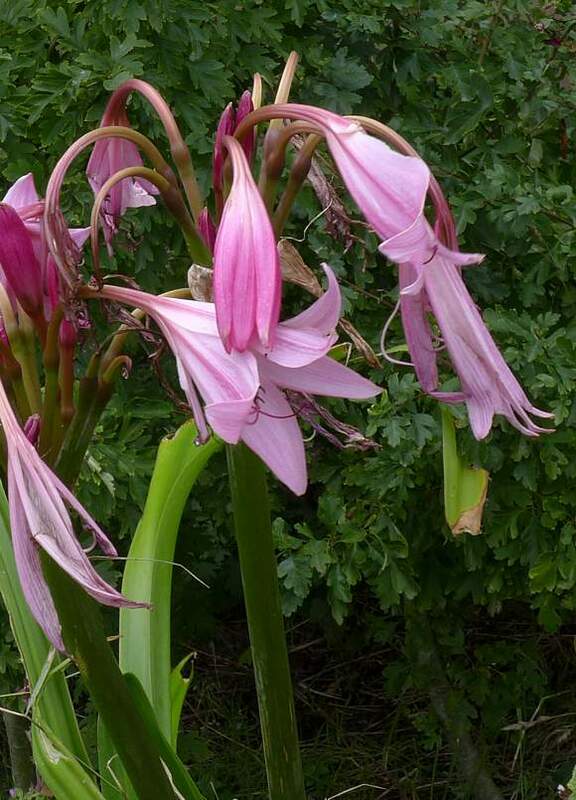 The flowers are large with 6 tepals which fuse into a tube further down. N.B. 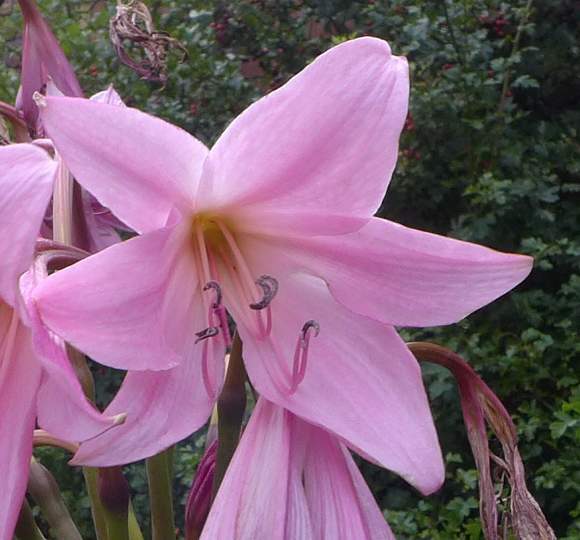 The central flower here is not a dual-cone effort, but rather 2 separate flowers where the stalk of the inner flower has poked through between two tepals of the outer flower. 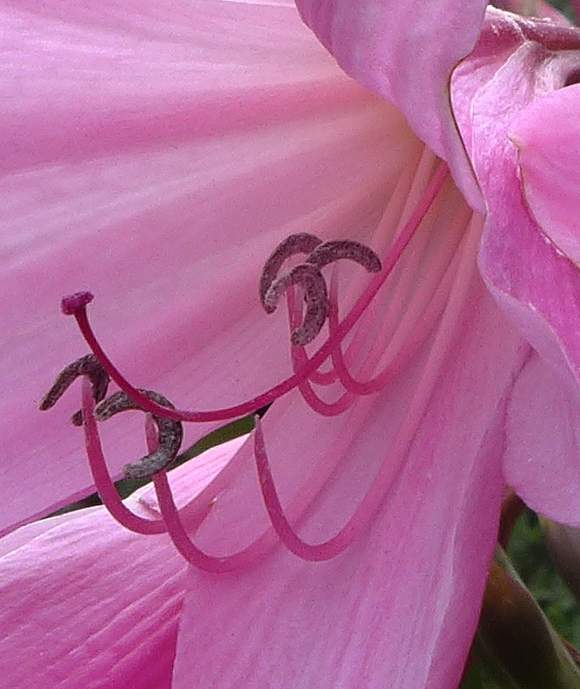 The pink tepals are slightly ribbed especially along their centre-line. They are fused at their base. 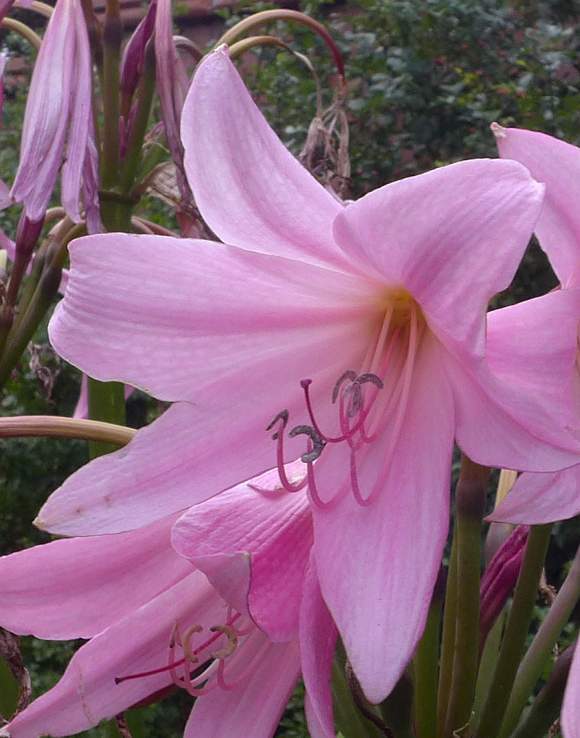 The single pink style ends in a short bar-shaped stigma. There are 6 pink filaments with an indigo-coloured horseshoe-shaped anther joined to the filament in the centre (one filament has lost its anther). 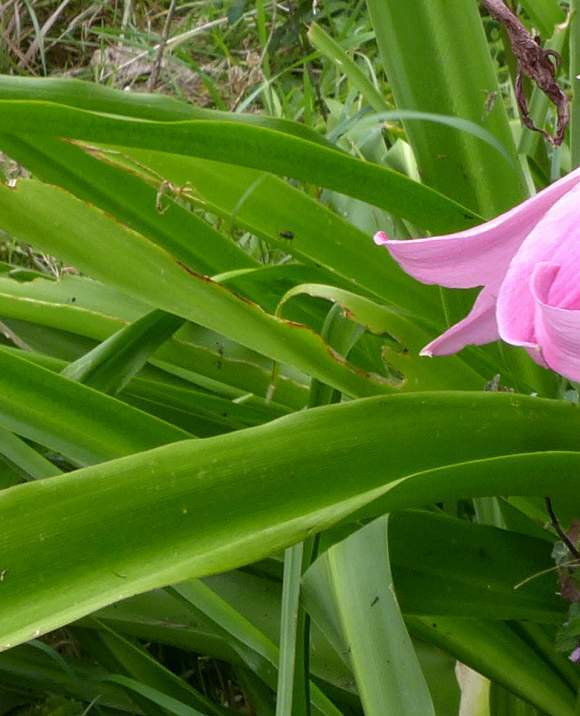 The flower stalk is in two parts with a swollen junction joining the perianth (lower) to the hypanthium (upper) [or so your Author thinks from the Kew plant dictionary of terms]. Together they add up to 12-22cm long 'stalk'. The broad but very long leaves are curved into a U-shaped gutter for added stiffness, rather than the usual V-shape of many other plants with long linear leaves. 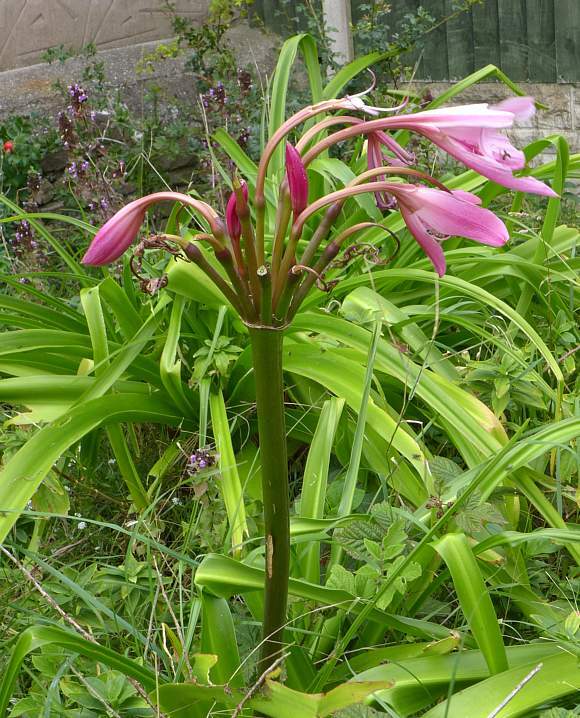 There is only one plant in the Crinum genus which escapes in the UK somewhere; but there are many others (about 130) World-wide. 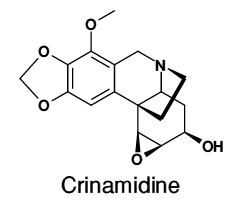 Crinine type alkaloids have a 5,10b- EthanoPhenanthridine nucleus at their heart (that is the three 6-membered rings). 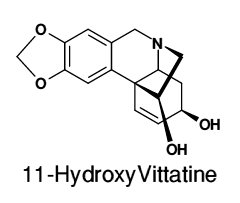 They possess a wide range of interesting medicinal effects such as exhibiting immuno-stimulant, anti-viral, anti-microbial, antineoplastic (acting to prevent, halt or inhibit the development of a tumour - a term which is applicable to dozens of chemotherapy agents) and analgesic properties. They are also toxic. 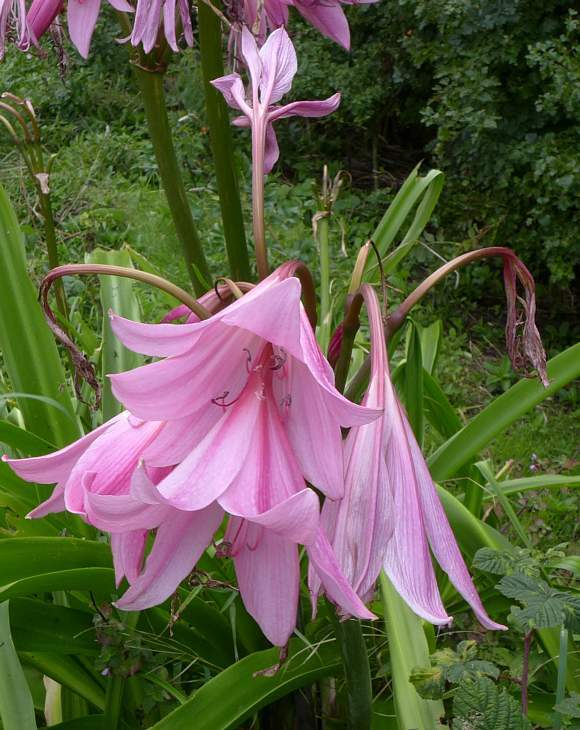 Crinanes compounds are named after the Crinum genus in which the alkaloid was first found. 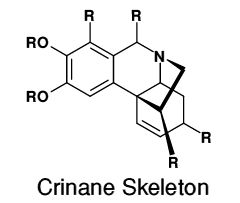 The crinane skeleton of Crinane compounds, where any R (radical) can be any radical, for instance in Crinane itself, the right-most radical is -OH, the left-most two conjoined methoxy (-O-CH3) moieties, all the other radicals are just -H. The very differing names of these very similar alkaloids reflects the wide variety (about 130) of the differing plants in the 'Amarilladaceae' sub-family in which these compounds are also found. 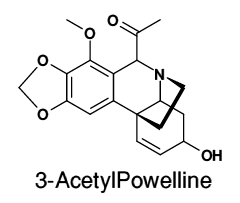 In fact, Powell's Cape-Lily has but a small subset from those alkaloids (about 14 - there were two your Author could not find the structural formulae for). Notice the single nitrogen atom is shared by conjoined 6- and 5-membered rings. 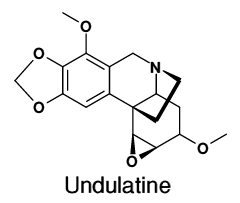 These alkaloids are all toxic to various degrees, the toxicity probably modulated by the extra moieties attached to the molecules, especially any epoxy groups. 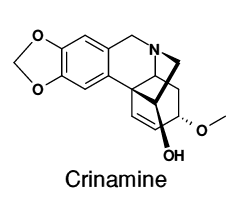 Crinamine (above left) and Haemanthamine (below left) seem to be stereoisomers of each other. 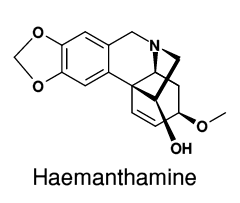 Haemanthamine, which is also found in Wild Daffodil, is named after the Heamantheae tribe (which is one of the tribes within the Amarylidoideae sub-family). 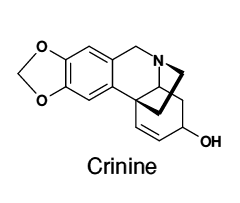 Crinamidine (above right) and Undulatine (below right) have an epoxy moiety breaking the double-bond. 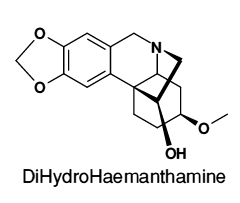 DiHydroHaemanthamine has one of the double-bonds in Haemanthamine broken, and 2 extra hydrogen atoms. 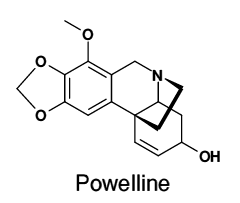 Powelline is obviously directly named after Powell's Cape-lily in which it is found. 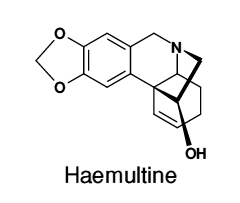 Haemultine lacks any group on the lowest 6-membered ring. 3-AcetylPowelling has an acetyl moiety on top of the 6-membered ring with the nitrogen atom. All the alkaloids on the left have an -OH moiety on the 5-membered nitrogen ring, even 11-HydroxyVittatine . 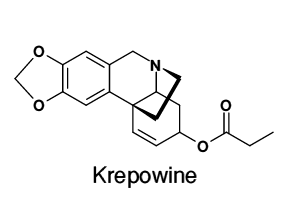 Krepowine has an acetyl moiety on the lower 6-membered ring. The -OH moiety on the 5-membered nitrogen ring is absent from all the alkaloids on the right. How's that for grouping?